Krnov is situated at the confluence of Opava and Opavice rivers, nearby the Czech-Polish border. The date of the town establishement is not given. The first written mention is from 1240 – Kyrnow. A German name Jägerndorf was firstly mentioned in 1253. The town name in medieval documentation was latinized to Carnovia. Krnov was established at the crossing of trade routes, connecting Baltic towns with Italy. The town beginnings come from the 13th century, firstly mentioned in historical documents in 1240, in the charter of Czech king Václav I. The castle of Krnov – Cvilín, built of stone in the 13th century, was the seat of earl Mikulas from Opava. Krnovsko region was an important territorial unit, lying at the edge of Moravia and Silesia. In the period of fights and war events, foreign troops and armies such as Tatars, Danes, Swedes etc. crossed over this region. Many princes ruled the region, the last one was Jiří Krnovský, a commander in Chief. 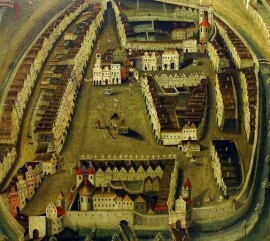 Due to being contravened with Habsburgs, the principality was confiscated, its owner was put into the jail and the prince gave the land to Karl of Lichtenstein. At that time, Europe suffered from the 30-Years War and Krnovsko regions was continuously plundered by Danish and Swedish troops. In 1849 Krnov principality disappeared and Krnov became one out of 7 districts of Austrian Silesia. At that time, Krnov had 59 875 inhabitants, with 74 vilages under its administration. At the turn of the 19th and 20th century, Krnov became of the most important towns of Austria – Hungary, thanks to its developing textile industry. In 1379, a trade house with a cloth was established. Due to archeological findings it is obvious that Krnov has been settling for about 30 000 years since the older Stone Age. Up to 7th century, the settling was exclusively Slavonic. This fact is supported by written records of Holasic tribes. Glacial boulders and other stuff brought by glacier reminds the glacial age. The post-glacial age represents the finding of a cave bear tusk and many others. Findings from nearby Brumovice village come from the Younger Stone Age. Fortified settlements, located on both side of Cvilín hill come from Neolithic Age. 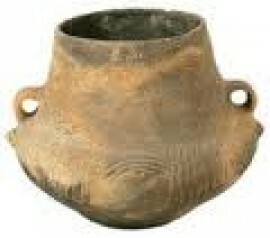 The age of field people reminds especially findings such as iron containers or an iron axe from 11th and 12th century. Early beginnings of the town in the 13th century are connected with the town symbol, firstly mentioned in 1311. The oldest symbol shows three red horns, covered with gold in a blue field, heading three different directions. The horn mouthpieces meet in a gold circle in the middle. There are three six-pointed stars among the horns. The same symbol is included on the town stamped document from June 16 1311, declaring that a reeve Petr and town councilors recognize the king Jan Lucemburský as their lord and pay tribute to him. The symbol remained unchanged for centuries. Yet in 1641, the symbol is on a town stamp. Later, coverings and casques appeared in the background of the renaissance shield. The casque is with a crown, above which a horn and a six-pointed star is floatinig. This was so called “the large symbol of Krnov”. 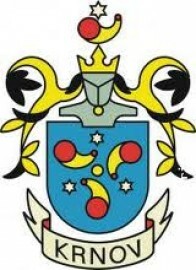 This symbol used to be on the old Krnov town hall. At present time, you can see the symbol of the town placed on a new town hall, built between 1901 – 1903. It is placed in the middle part of the tower, above the main entrance and in the ceremonial hall. Unfortunatelly, there is no record how the symbol originated and what actually symbolizes. There have been many interpretations, but these are attempts only. One of them, probably the most authentic is that the horns symbolize three trade routes: from Olomouc, Opava and Glubczyce converging just at the square in Krnov, which is the symbol of the circle in the middle of the symbol. Silver stars are to symbolize the merchants´ hope to do a good business and a safe return. The symbol of Krnov belongs among the oldest and the most interesting ones. Krnov town is situated in the northeastern part of the Czech Republic, at the confluence of Opava and Opavice rivers, at the foothills of Nízký Jeseník, nearby the Czech-Polish border, in Bruntál district, Moravskoslezský county. Krnovsko is a region of an industrial and agricultural character. The town area is 44,4 km2. The population of Krnov is 24 754 inhabitants (December 31 2012). In the last years, Krnov has been changing from an industrial town to the green one. 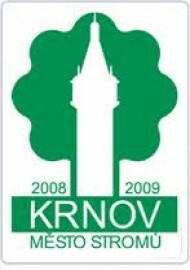 Krnov was awarded with a prestigious prize “the Tree town 2008/2009”. In 1997 Krnov was affected by serious floods, covering nearly the entire town. Except the loss of one human life and enormous material damages (440 billion Czech crowns) on buildings and roads, the floods also damaged one hundred trees in town parks. Another natural disaster affecting Krnov on June 8 2013 was a tornado. It caused damages on 5 kilometer long lane. The tornado blew over town areas such as Ježník, Kostelec and then it moved towards Býkov – Láryšov. 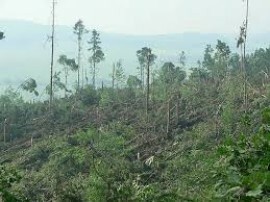 It destroyed roofs of more than 40 houses and caused serious damages of forests. Web Silesia without borders » Tours with QR codes » Tour "History"